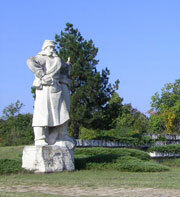 “General V.N.Lavrov” park is situated by the road from Pleven to Sofia at a distance of 25 km to the west of Pleven. As soon as the Russo-Turkish war of 1877-1878 was over the Russian government and the very regiment that had taken part in the battles, erected monuments over the common graves of the perished guards at the village of Gorny Dabnik. In the period of 1950-54 a park was made around these monuments. The architectural design was made by V.Tiholov and the park was arranged under the guidance of A.Vodopianov. In 1977 the whole park was reconstructed and new monuments were erected. The park is a part of the program “Beautiful Bulgaria” and in 2001 it was restored as a part of our cultural and historical heritage. 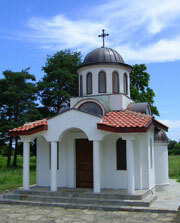 In 2004 a chapel “St. George Martyr and Victor” was opened in the park. This memorial park is situated on the very place of the former battlefield in memory of the Russian guards who died in the battles on 12th/24th October 1877. It was named after the wounded to death in the fight Russian general Vassiley Nickolaevich Lavrov. There are monuments of the Life-guards regiments, of the 3rd rifle Finnish battalion; sculptures of heroes and an open-air exhibition of Russian guns.